Want to know the truth about a culture? You look to its myths and legends. For us, those myths, writ large, come in the form of comic book heroes, and with Captain America: The Winter Soldier, Marvel Studios use their “Living Legend” to show us a tense but ultimately hopeful reflection of our culture. 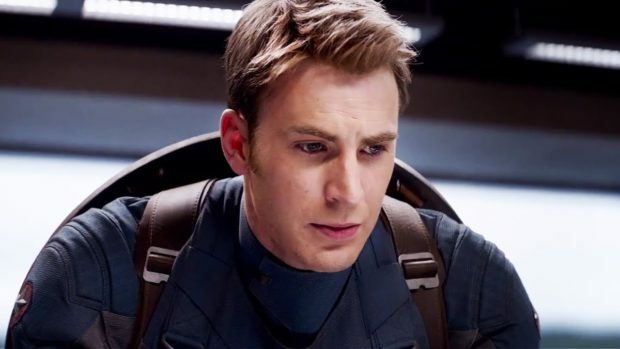 When last we saw Steve Rogers (Chris Evans), it was in The Avengers, new to the modern world but on a clear-cut mission to save it from alien invasion. Now he has been serving S.H.I.E.L.D. for a while, and it isn’t that he’s having trouble adjusting — it’s that it’s hard not to equate adjusting with compromising into a society that no longer seems like the American ideal. Just as in writer Ed Brubaker’s original comics story The Winter Soldier, this star-spangled superhero reflects the nation, grappling with uncertainty and unease, struggling to do the right thing while remaining a good soldier. 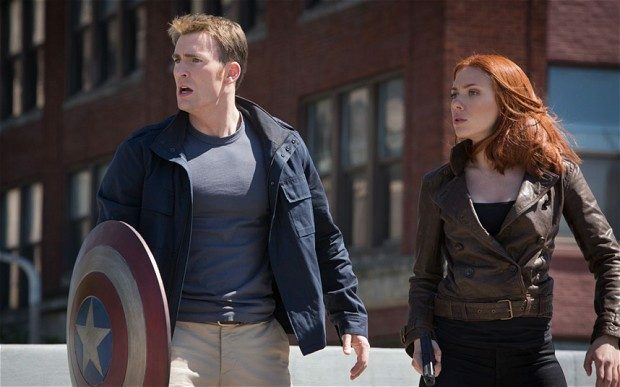 What should be a routine rescue turns murky when Steve realizes that the Black Widow (Scarlett Johansson) has a different mission objective than he does. 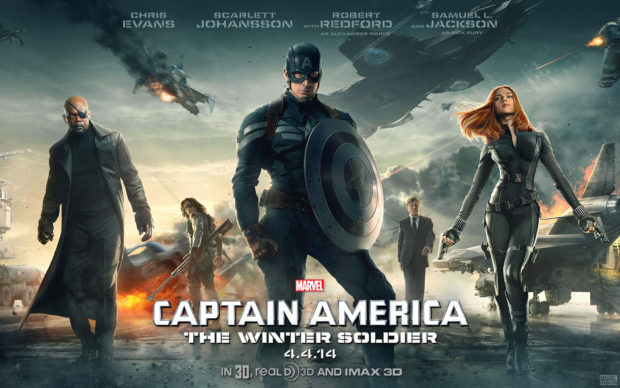 For Steve Rogers, the ends do not justify the means, and upon returning he finds himself at odds with S.H.I.E.L.D. head Nick Fury (Samuel L. Jackson). But all is not as it seems, and long before the titular character makes his chilling debut, the plot has turned labyrinthine. Screenwriters Christopher Markus and Stephen McFeely create a suitably disturbing political thriller, and then Marvelized it so we can perhaps sleep at night. After all, how scary can echoes of government surveillance and souped-up drone strikes be if mixed with that unrealistic super-soldier formula? Though many of the plot points harken back to The First Avenger, this is an entirely different kind of movie, and it’s probable viewers who have not seen the earlier films will still be drawn in. It’s tense and taut without a wasted scene, recapping only where necessary and very economically. 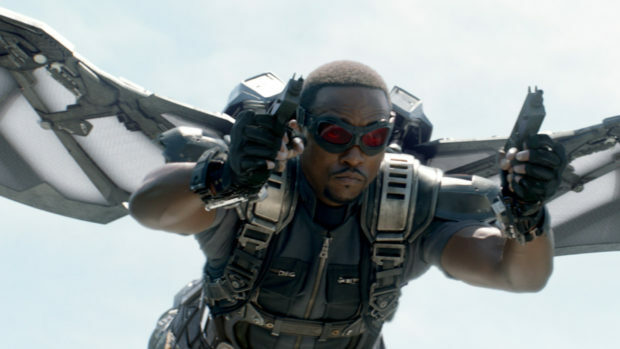 It also introduces a great new hero to the mix in the form of The Falcon (Anthony Mackie). Updated from a well-meaning but blaxploitation-based 1970s origin, now Sam Wilson fills a gap in Steve Rogers’ mission. After two tours in Afghanistan, Sam works as a counselor in the VA, first bonding with Steve over the difficulty in adjusting to civilian life, and then with a secret skill with high-tech armor when it’s clear Captain America needs a new ally, too. Okay, not so secret. You’ve seen the commercials and you’ve seen the action figures. The Falcon is a worthy addition to the Marvel Cinematic Universe. He also adds a great kinetic energy to the film, which balances conversations about what freedom actually means (thus what the hell was Captain America fighting for?) against terrific action. Joe Johnston and Joss Whedon had already shown how effective Captain America can be in a fight, but the Russos take it a step further, making the shield feel like an extension of Steve, though several sequences also prove it’s the man that makes the weapon. So to the actors, all throwing the dialogue around with the dexterity of Cap throwing his shield. Once you get past the jarring idea that one of the greatest movie stars of the 20th Century, Robert Redford, is a supporting character, you have to realize that Marvel really has changed the game. And Redford does not disappoint, matching wits with Jackson and Evans, keeping his cards close to the vest. Johansson — well, again, she simply needs to be given a solo movie, as she imbues Natasha Romanoff with an icy charm. She could be, should be, a huge action star. But none of it would work without Evans. Other actors have played superheroes well, but as much as I admire what Robert Downey, Jr. does to bring Tony Stark to life, it’s still Downey. Chris Evans IS Captain America, in the way that Christopher Reeve IS Superman. The difference is that we’ve seen Evans in reverse. Reeve was an unknown quantity; Evans had a decade or so of being the cocky teen-ager and twenty-something, which made him a good Johnny Storm in Fantastic Four. But the swagger here is an earned confidence, and not one used to intimidate anyone who does not deserve to be intimidated. He embodies the best of what we say we are. In flashbacks we get reminded of the skinny Steve Rogers, and one shot puts both versions looking at each other. It’s not a CG trick, and it’s not quite that they’re two different people, but Evans shows us both the fundamental changes in Rogers’ personality in that shot — and the core values that stayed exactly the same. The character isn’t just a super-hero, he’s a hero, plain and simple, because of who Steve Rogers was, is, and always will be. And we are completely drawn in along for the ride, with no ironic distance, because Steve Rogers isn’t a pose. He is that man. And that man is worthy of the legend. We’re ready to follow him into the next adventure, which has just had the bar raised. Captain America: The Winter Soldier doesn’t just give us hope, that good does triumph, that compassion can still be as valuable as action. It proves that a superhero movie can be a film, with ideas that resonate and still have us chewing the popcorn. It is the best of the Marvel movies so far. Time for James Gunn to throw out his shot across the bow.